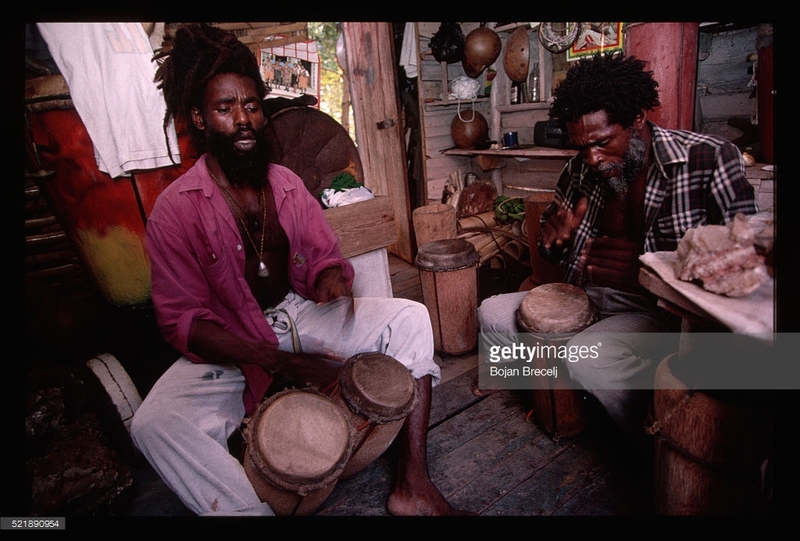 Rastafarians singing and playing bongo drums in Jamaica. News Americas, WASHINGTON, D.C., Weds. Aug. 24, 2016: The U.S. says there are six Caribbean nations where members of the Rastafarian faith feel they are being discriminated against. In Antigua & Barbuda, the US report says it has received complaints from The Caribbean Rastafari Organization that the Antigua & Barbuda government’s prohibition of marijuana contradicts the religious rights of Rastas in the country because marijuana is integral to their religious rituals. The Rastafarians also say they disagreed with the public school requirement that children be vaccinated, which they state is against their religious beliefs and they also said the requirement to remove their headdress for passport photos and at security checkpoints was an additional infringement of their religious rights. In Jamaica, Rastafarians complained that elements of their religious observance, such as wearing dreadlocks and smoking marijuana, still presented some barriers to their ability to find employment and achieve professional status. Some also stated they had had their hair cut by police or prison officials, and several were exercising legal recourse measures. Still Rastafarians, however, stated that such discrimination had diminished considerably in recent years, especially as their styles of clothing and music gained wider acceptance. In February both houses of parliament In Jamaica, passed a law which ended the government’s longstanding criminalization of marijuana, including for religious purposes, and the law went into effect in April. Among other stipulations, the law permits adherents of the Rastafarian faith to use marijuana for sacramental purposes in locations registered as places of Rastafarian worship. Rastafarians in Saint Kitts & Nevis say they continue to face discrimination, in employment as well as in public and private school officials refused to enroll Rastafarian children because of their belief against vaccinating their children in violation of national laws. They also say they Rastafarians are prohibited use of marijuana, which they described as integral to their religious rituals and face discrimination in observing religious holidays since government-run community development centers allow Christian groups to perform tree lighting ceremonies for Christmas at no charge, but Rastafari groups wishing to celebrate Kwanzaa are charged US $148. Additionally, representatives locally also said that prisoners were forced to cut their hair and that the government did not accommodate vegetarian diets in prison. According to the Caribbean Rastafari Organization, Rastafarians in St. Vincent & The Grenadines continue to disagree with the government’s prohibition of marijuana use, which they described as integral to their religious rituals. Rastafarians here also stated they faced scrutiny from police and immigration officials and also expressed concern about discrimination in schools and in hiring. In The Commonwealth of Dominican, Rastafarians also complained about the government’s prohibition of marijuana use, which they described as integral to their religious rituals. Rastafarians also stated they faced extra scrutiny from police and immigration officials. In The Bahamas, Rastafarian leaders reported their members continued to experience police profiling and targeting due to their belief in the religious use of marijuana. They also expressed concern that prison officials cut the dreadlocks of Rastafarian detainees held in short-term custody, and that prisoners at Bahamas Correctional Services were not regularly provided with meals that met their religious dietary requirements.